Here, kitty kitty! 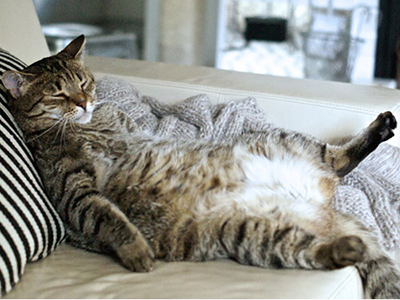 If your cat is looking a little rotund or losing energy to play, it’s time to start looking at slimming solutions. 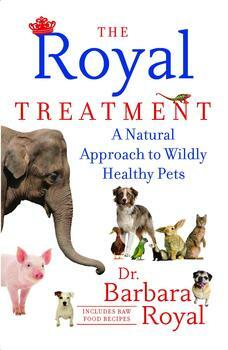 Dr. Barbara Royal, author of The Royal Treatment, shares her tips—including very valuable advice about cats’ carnivorous needs (don’t EVER try to make them vegan!) and the shocking truths about commercial pet food. 1. Start with a low-carb food. This is even more relevant for cats (the “Catkins” Diet). They are obligate carnivores and carbs can cause obesity, diabetes, and other health problems. Find foods that are predominantly protein, with a normal amount of fat and low carbs. Don’t try to look for low-fat foods for cats. They need fat in their food to lose weight. Again, they must lose weight very slowly. 2. Cats must eat every day or they can get seriously ill. Offer a preferred dish if your cat won’t eat a new food within an hour or so. Even if it’s just what the doctor ordered, it may not be what the cat would have ordered. They would rather starve than munch on something unpalatable to them. And even the best cat foods in the world can be considered yucky to some cats. You can’t force them by waiting them out. 3. Add warm water to wet or raw foods to increase volume of the food filling the stomach, improve aroma, make the food stay moist longer in the bowl, and help hydrate your cat. 4. Don’t make the food too easily available. A cat that sits by the food bowl and can take a mouthful whenever the mood strikes is more likely to be fat than a cat who has to leave a favorite cozy spot, hike up some stairs, and head to the back of the house to get to the food bowl. If it takes all that fuss to get to it, they will more likely eat only when they are hungry. For physically challenged cats, make sure food is accessible, and do your best with the exercise part. Cats’ bodies are built to be active hunters. Getting food should require motion. It keeps them healthy. 5. Consider twice-a-day feeding instead of free feeding. If your cat will eat canned or raw foods, this may be easier to do than with dry foods. A cat may nibble on dry food because it’s not that tasty, and they don’t want to eat a lot at once. If a cat will eat canned or raw food, he may eat a full meal in one sitting. When the food is gone, the food is gone. This is a good way to regulate amounts of food. 6. Play games with your cat. Even older animals will play if you find the right toy or game. Some food-motivated cats will even chase a piece of kibble or a dried meat treat down a hallway. The urge to hunt/play is never fully dormant in a cat. 7. Make sure treats are carb-free where possible. Remember there’s a sensitive carnivore in your cat. 8. Keep track of how often your overweight cat defecates. If it’s more than once a day, you’re feeding too much. The body won’t lose weight unless it feels the need for the fat.